Amini, M., Javanmard, A., Davati, A., Azimi, G. (2009). Bacterial Colonization in Tracheal Tubes of ICU Patients. 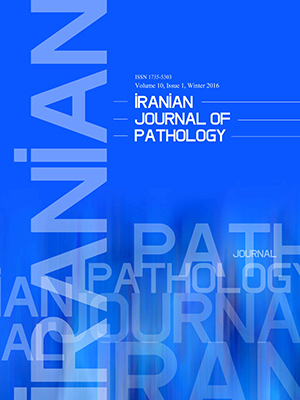 Iranian Journal of Pathology, 4(3), 123-127. Maryam Amini; Ahmad Javanmard; Ali Davati; Ghasem Azimi. "Bacterial Colonization in Tracheal Tubes of ICU Patients". Iranian Journal of Pathology, 4, 3, 2009, 123-127. Amini, M., Javanmard, A., Davati, A., Azimi, G. (2009). 'Bacterial Colonization in Tracheal Tubes of ICU Patients', Iranian Journal of Pathology, 4(3), pp. 123-127. Amini, M., Javanmard, A., Davati, A., Azimi, G. Bacterial Colonization in Tracheal Tubes of ICU Patients. Iranian Journal of Pathology, 2009; 4(3): 123-127. Background and Objectives: Nosocomial infections are one of the most important worldwide health and increased patients hospital stay, therapeutic problem and mortality rate. This study was designed to determine the frequency of microorganisms isolated from tracheal tube in patients admitted to ICU Shaheed Mostafa Khomeini Hospital Tehran, Iran, from 2001-2005. Patients and Methods: In this cross-sectional descriptive study, 352 patients admitted to ICU of the hospital were evaluated from 2001-2005. Information was derived from 18 questions in 2 parts, demographic and clinic/paraclinic. Data were analyzed by SPSS statistical software, and Mean Whitney, chi-square tests. Results: Most patients were in 70-98 years age group, with the mean age of 62.73±10.03, 64.2% & 35.8% were male and female, respectively. The highest hospitalization times were 2-30 days with the mean times of 24.06±16.68 days. In addition, the median time of intubation was 9 days. The most common microorganisms were Staphylococcus aurous (23.6%), Klebsiella spp. (23.3%) Acintobacter spp. (20.7%), Pseudomonas aeroginosa (18.2%) Escherichia coli (7.7%), and Enterobacter spp. (5.7%) .There was significant association between the time of endotracheal intubation and S. aurous, P. aeroginosa, Klebsiella spp., Enterobacter spp.. (P<0.05), and between E-coli and hospitalization time (P<0.05). No significant association was found between Acintobacter spp. and other microorganism with other variants. Discussion: It seems that there is no difference between our research and other studies about microorganism isolated from patients with endotracheal tube. We recommend a similar study designed in another hospital to determine the epidemiologic pattern of microorganism frequency.